The earliest specific map of the Andaman Islands. A New Chart of the Andaman and Nicobar Islands, with the Adjacent Islands, from the Draughts and Observations of Captn. Phins. Hunt, Captn. Mackay, Captn. John Ritchie, and Lieutt. Mc. Cluer, & c.
A very scarce and exceptionally fine example of Laurie and Whittle's 1798 nautical chart or maritime map of the Andaman and Nicobar Islands. The map covers from the Cocos Islands eastwards past Great Andaman, to Nicobar or Great Sambelong Island. Throughout, there are numerous depth soundings, notes on reefs, commentaries on the sea floor, and a wealth of additional practical information for the navigator. The routes taken by various navigators associated with the construction of this map, including Captains Hunt, Mackay, and Ritchie and Cluer are noted. The Andaman Islands were well known even in antiquity. Though Ptolemy may have mentioned them under a different name, they were definitely referred to by 9th century Arab geographers. In the 10 century the Persian navigator Buzurg ibn Shahriyar of Ramhormuz refers to them in his narrative Ajaib al-Hind (The wonders of India). Shahriyar describes the inhabitants of Great Andaman as fierce cannibals - most likely the source for the very similar comment appearing on our map. Marco Polo also refers to the Andamans where, in one of his more whimsical and memorable passages, he describes the inhabitants as having heads like dogs. Shortly before this map was issued, in 1789, the British admiral Archibald Blair founded a penal colony on Chatham Island, near the southeastern extension of Great Andaman. Two years later, the colony was moved to the opposite, northwestern, portion of the Island and renamed Port Cornwallis. Ravaged by disease, the colony was abandoned after just two years. Nonetheless, both regions are highlighted by inset maps located top center and the brief colonial incursion may be considered the original of this map. Further insets illustrate the Channel between Great Andaman and Little Andaman as explored by Captain Duncan in 1759 and 1760, and the Harbor of Carmorta or Noncowry. There are additionally five land profile views scattered throughout the map. 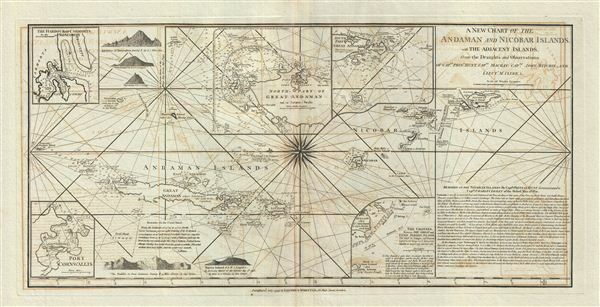 The lower right quadrant features a lengthy annotation by Captain Phineas Hunt describing the region, in some cases contradicting established knowledge of the islands, and commenting the fauna, colonies, indigenous population, and provisions available - no doubt priceless information for the mariner. Today the Andaman Islands, situated in the middle of the Indian Ocean, are largely administered by India. The nearby Cocos Islands, visible in the western part of this map, are administered by Burma. The islands were devastated by the 2004 Tsunami, but a strong local tradition of fleeing inland after earthquakes resulted in minimal human loss. The islands are renowned for their breathtaking beauty, excellent surfing, and world class diving. Laurie and Whittle prepared this chart for their 1799 issue of the East-India Pilot. Though most charts in the East-India Pilot were derived from earlier maps prepared for Jean-Baptiste d'Apres de Mannevillette's 1745 Neptune Oriental, this particular chart is a new British production unique to Laurie and Whittle. The chart is a direct result of the attempted British penal colony and could not have been drawn prior to the related survey efforts. This map may thus be considered exceptionally significant and the earliest specific map of the Andaman Islands. Laurie, R., and Whittle, J., The East-India Pilot, or Oriental Navigator, on One Hundred and Eighteen Plates: Containing a Complete Collection of Charts and Plans, &c., &c. for the Navigation not only of the Indian and China Seas, but of those also between England and the Cape of Good-Hope; Improved and Chiefly Composed from the Last Work of M. D'Apres de Mannevillette; with Considerable Additions, from Private Manuscripts of the Dutch, and from Draughts and Actual Surveys Communicated By Officers of the East-India Company A New Edition, Containing One Hundred and Five Charts. (London: Laurie and Whittle) 1799. Very good. Minor wear and verso repair along original centerfold. Original platemark visible. Some offsetting. Some spotting. National Library of Australia, MAP Ra 72 Plate 37.